Carte de visite (CDV) measuring approx. 2.5 x 4.25 inches. Photographer is Joslyn of Kenosha, Wisconsin. This photo is undated and unidentified, but it comes from an album from which I have previously posted other pictures, including another one from Kenosha. 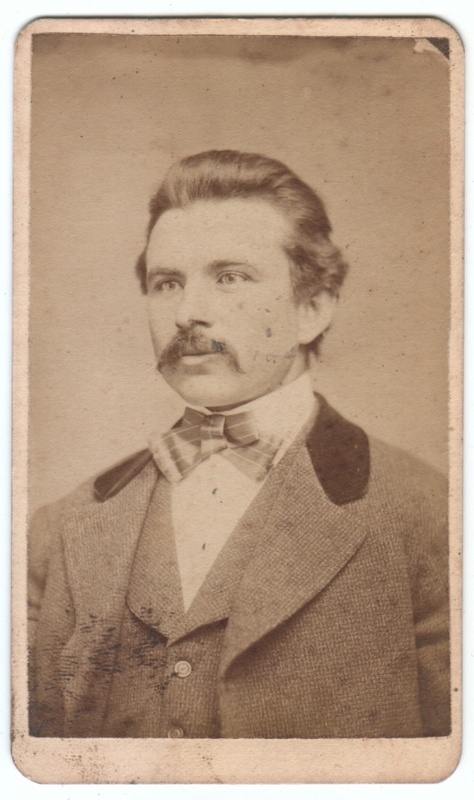 This CDV is a little worse for wear, but I like it anyway, a striking image of a handsome man. Interestingly, the printed photographer’s information on the back reads Joslyn / Photographers, / Kenosha, Wis., except that the line reading “Joslyn” has been altered. Whatever name had been there before was removed through scraping or heavy erasing, and the word “Joslyn” was added in pencil. I did find a reference to a photographer named James H. Joslyn living in Kenosha around that time period, so I’m guessing that’s the same person, but it’s just a guess. He is handsome. And, has a very contemporary face. I imagine he broke a heart or two. Again, we can put him as a Jamesian scalawag. Also, whoever was the Barbara Cartland of the day.